If you are looking for Tulare Medical Waste Disposal, We’ll save you at least 30%! Pacific Medical Waste offers a full suite of Tulare medical waste disposal services including sharps disposal, red bag waste disposal, hazardous waste disposal, pharmaceutical waste disposal, amalgam waste disposal and other dental waste disposal services and more. See our list of services below for a complete overview. Since 1998, Pacific Medical Waste has helped countless organizations in Tulare, California by providing a safe, reliable and cost-effective medical waste disposal service. Tulare is located in the heart of the Central Valley, eight miles south of Visalia and sixty miles north of Bakersfield. The city is named for the currently dry Tulare Lake, once the largest freshwater lake west of the Great Lakes. The city’s mission statement is: “To promote a quality of life making Tulare the most desirable community in which to live, learn, play, work, worship and prosper.” The Stockton seaport is 170 miles (270 km) away, and the Sacramento port is 207 miles (333 km) away. The Los Angeles and San Francisco ports are each approximately 200 miles (320 km) away, making Tulare a hub or central location for product movement. Pacific Medical Waste’s Tulare, CA hospital services include disposal of medical and biohazardous waste, pharmaceutical waste, reusable sharps waste services, waste segregation and consulting, disposal of RCRA hazardous waste and more. 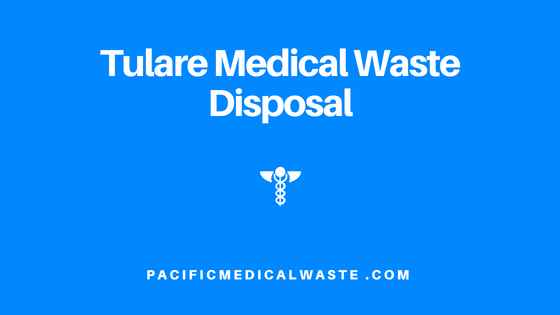 From small to large scale healthcare facilities in Tulare, Pacific Medical Waste offers a fully compliant medical waste disposal program that we tailor specifically for each organization. Pacific Medical Waste’s hazardous waste management services in Tulare, California are a cost-effective, safe, reliable and environmentally friendly way for your facility to dispose of trace chemotherapy waste and other biohazardous wastes. Our biohazardous waste management specialists will work with your organization to create a custom waste disposal plan that will immediately cut costs while streamlining processes. Pacific Medical Waste’s Complete Compliance programs are a perfect addition to your medical waste service – there’s no easier way to stay compliant. Complete Compliance training programs help keep you and your staff safe, greatly helping reduce accidental exposure in the workplace. Clients have utilized Pacific Medical Waste’s OSHA compliance training in Tulare, California for annual bloodborne pathogens training, HIPAA training and more. Whoever heard of a medical waste disposal company that actually helps their clients reduce their bio-hazardous waste? We are the only company that will audit your waste stream for free and reduces your medical waste, with our three-step waste reduction program.